Every year since the memorial was first erected at the International Airport in 1977, officers from around the state have stood guard duty around the monument. Officers stand one hour of the vigil while a LEMA Honor Guard Officer walks the Thin Blue Line. This guard is changed every 20 minutes with a precision rifle inspection by the Sergeant of the Guard. An especially poignant point of the Memorial Guard involves canine officers with their partners sitting quietly in memory of the our fallen officers, and the several canines that have been lost on the job, many protecting the lives of their handlers. This event is held from 8:00 AM until 7:30 PM. For more images of the Memorial and events, head over to our Gallery page. 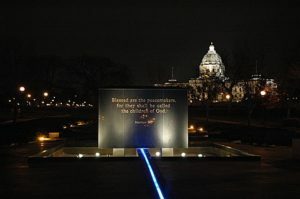 The Minnesota Law Enforcement Memorial Association was formed in 1974 by Jim Crawford, then Chief of Police in Golden Valley, MN. 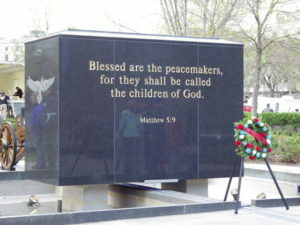 LEMA was founded with the sole purpose of building a memorial to Minnesota peace officers who had died in the line of duty. This memorial was designed and the fundraising began. In 1977, the beautiful granite memorial was erected in the main concourse of the Minneapolis-St. Paul International Airport. 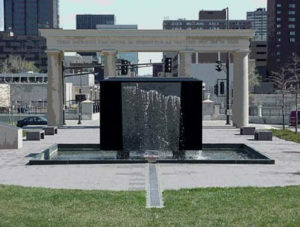 The memorial remained on display there until it was moved to its new home in the centerpiece of the Peace Officer’s Memorial on the capitol grounds in St. Paul. Once the memorial was built, LEMA expanded its service to include granting college scholarships to the immediate family members of fallen officers. Nearly $100,000 in scholarships have been awarded. LEMA also sponsors an annual memorial service hosted by departments around the state. This service is held the first Sunday in May of each year. It is at this service that a ribbon bearing the name of each officer lost in the line of duty during the year is installed permanently on the LEMA flag. This service also includes the reading of the Honor Roll, the list of names of fallen Minnesota officers. As of January 1, 2018, this list includes the names of 280 officers dating back to 1881. Other services provided by LEMA include Police Week activities, including the Memorial Guard and Candlelight Service. The Thin Blue Line is a phrase known world wide to Police Officers…It denotes the final barrier which stands between our citizens and chaos. The only time this line is disrupted is when an Officer has fallen or is injured in the course of executing his sworn duty. At the end of duty, when this breach appears, our youngest, and finest step up to fill in the line and help maintain order and serve our citizens. The memorial is located at 6 12th St E St. Paul, MN 55101. Use the interactive map below to get directions to the memorial from you address.